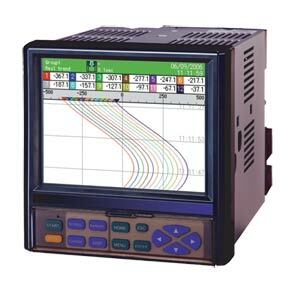 RD9900 Series are network compatible paperless recorders with high performance and high operating function employed high visibility 5.6" TFT color LCD. High speed of sampling rate 100 ms for 12 points and high accuracy of ±0.1% were realized, and measured data is stored into internal memory and maximum 2 GB compact flash card. As it can be monitored by a web browser display on several computers on intranet or internet, FTP transfer of data file and e-mail notification are also available. The recorder can be used for various applications such as data management, research, development, remote and wide range monitoring by utilizing internet environment. Setting Screen: Alarm, computation, memory, system, maintenance, communication, etc.